This is a summary of the menus that have been arranged for Warpstock 2010 at the University of Waterloo. This is a jpg version of the section of the campus map for those attending Warpstock 2010. The Conference Centre is in the Ron Eydt Village (marked REV on the map). The marked position 1 is the location of the main entrance and the registration desk. The marked position 2 is the entrance closest to the rooms. The marked position 3 is the parking lot V that we will be using. 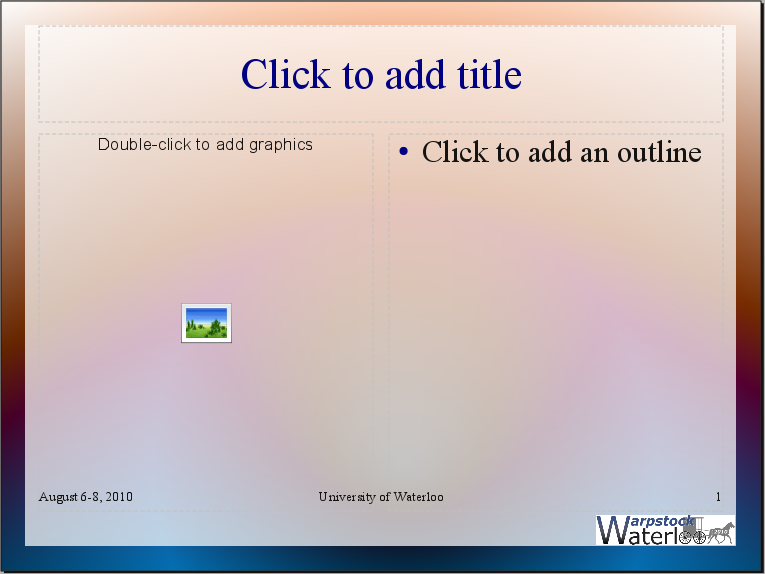 This is a very basic Impress (3.1) template, based on a blue and red gradient background. It includes the official event logo in the lower right corner of each slide (not the handouts), as well as the event dates and event location in the footer (see screenshot). Feel free to use this or not, or modify to suit. Enjoy! This is the mail-in registration form for Warpstock 2010 in Waterloo, Ontario, Canada in pdf format. Please download this file and complete the form and mail it in to Warpstock Corporation. Warpstock cannot accept on-site registrations for the 2010 event. All registrations must be made in advance. This is the mail-in registration form for Warpstock 2009 in Albuquerque, New Mexico in pdf format. Please download this file and complete the form and mail it in to Warpstock Corporation. Warpstock cannot accept on-site registrations for the 2009 event. All registrations must be made in advance. This is the map showing the entire campus. Ron Eydt Village (where Warpstock will be held) is located in block D3.